Volunteers collected samples found to contain trace amounts of the short-lived isotope cesium-134, considered the ‘fingerprint’ of Fukushima, during a research expedition from Alaska to California. Though cesium-134 is specific to the Fukushima disaster, another form of the isotope, cesium-137, had already been introduced to our oceans during weapons testing in the 1950s and ’60s. The levels of radiation detected in the WHOI effort were deemed “far below where one might expect any measurable risk to human health or marine life,” according to the release. In an interview with Northwest Public Radio (NWPR), Ken Buesseler, a senior researcher at WHOI, said that although he was reluctant to “trivialize” the findings, he isn’t concerned about swimming or eating fish from local waters. The radiation levels detected are reportedly 1,000 times lower than the acceptable limit for drinking water set by the US Environmental Protection Agency (EPA). 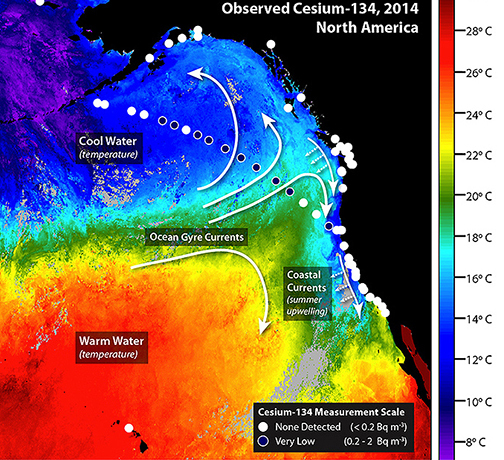 Though Canadian oceanographers have reported the presence of cesium-134 off the shores of Vancouver Island since 2013, seawater samples collected directly at the shore from California to Alaska by concerned citizens since the beginning of this year, through a crowd-funded "citizen science" project also initiated by Buesseler, tested negative for the offending isotope. 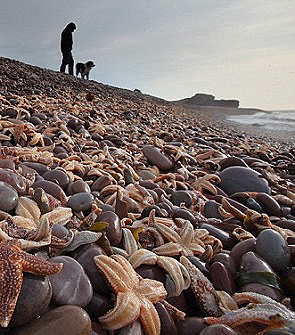 The US government does not currently fund ocean radiation monitoring. 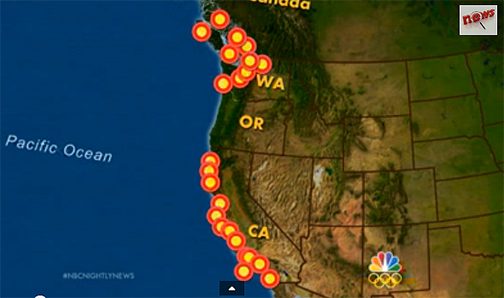 Meanwhile, a parallel research effort conducted by the radiation health lab at Oregon State University earlier this year did not find any traces of radiation in samples collected along the Pacific Northwest coast. The oceanographers at WHOI believe it’s important to keep close watch on the radiation levels in our oceans. “The spread of radioactivity across the Pacific is an evolving situation that demands careful, consistent monitoring,” the press release says. After undergoing meltdowns in three of its reactors in March 2011, TEPCO’s Fukushima plant released huge amounts of radioactive material. Contaminated water, used to cool the overheating fuel rods, streamed into the ocean. The cleanup process is expected to take decades.